Imagine you’re in line at Starbucks with a friend, and your friend asks you about the housing market. How would you describe what the Sacramento market is doing? It’s easy to speak in generalities about it being a good time to buy or sell, but when you get more specific, something powerful happens. You begin to sound like a pro. Check out ten quick talking points to help explain how the market is unfolding. The market over these past six months has seen a normal seasonal uptick, but values have been flattening out a bit lately. Different neighborhoods are experiencing different dynamics of course, but the overall market is more or less flat. 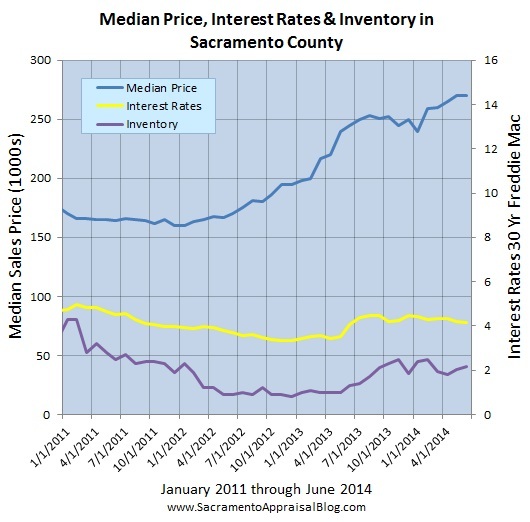 The median price in Sacramento County is currently $270,000. It’s normal in real estate to see listings increase during the Spring and beginning of Summer, but it’s still good to be able to explain that the number of active listings in Sacramento County was closer to 2200 in January and is now over 3000. This means buyers have more opportunities to get into contract. Housing inventory increased again this past month and is now at 2.16 months of housing supply. This means there is just over two months worth of houses listed for sale on the market compared to the number of sales last month. Keep in mind two months is still very low, which means there is still quite a bit of competition to get into contract. The graph above illustrates how much inventory is in each price segment, and there is clearly stiff competition below $400K. This underscores the reality that different price segments can experience different trends in the same market. Sales volume this past quarter is down 14% compared to the same time last year, but the good news is we’ve had three strong months of sales in a row. This is an especially welcome phenomenon after a couple dismal months in the beginning of the year. There were slightly more sales in June compared to May, but not really anything to write home about. It has been much easier for FHA buyers to get into contract these days compared to the beginning of 2013 when it was incredibly difficult. In fact, FHA sales increased by 6.4% when comparing Q2 2013 to Q2 2014. If you haven’t brushed up on FHA minimum property requirements, it may be a good time to do so since FHA is becoming more relevant again. Cash sales are down 13% county-wide compared to where they were one year ago (down 16% from their peak). There has been a dramatic decrease of cash in the Sacramento market, and it has really made the rest of the market adjust or “normalize” so to speak. What does it look like to be a market that is not driven by cash investors from outside of Sacramento? That’s what the housing market is trying to figure out. This graph shows cash sales from January to June in both 2013 and 2014. What do you notice? Cash volume was about two times higher (47%) in 2013 compared to 2014, whereas there have been more non-cash sales this year. When you’re talking to clients about how the market has changed, this is an X-factor. In other words, if cash volume was still as high as it was last year, inventory would be incredibly low, and the market would feel much like it did in early 2013. On average it’s taking just over one month (35 days) to sell a house in Sacramento County. This trend is about the same for the entire region (37 days), but I’ll get to that on Thursday. Generally speaking, the higher the price, the longer it takes to sell. Keep in mind there were only 12 sales between $750,000 to $1M, so don’t put too much weight in that category. Interest rates took another slight dip last month, but really rates have been flirting with the lower 4s all year. What happens with interest rates will directly impact affordability, which really matters since values are much higher than they used to be. The market still feels fragile, so if rates shoot up too quickly, it could be bad news for values. It’s doubtful The Fed would increase rates aggressively right now, but who knows. The real estate market has many “layers” that impact value. The keys drivers for the latest real estate boom were cash investors, historically low interest rates, and incredibly low inventory. Now the “layers” of the market have shifted though where inventory is increasing, interest rates are no longer in the 3s, and cash investors have sincerely stepped back their game. This means we have a real estate market that is much more sensitive to the health and strength of the local economy instead of being driven by rates and out-of-town investors. Key factors to watch over the next two quarters are inventory, sales volume, and interest rates. Sacramento County used to feel like Foreclosureville, but the market is simply no longer distressed. Both REO and short sales are hovering at about 7% of the market. This is very low considering in the first quarter of 2009 REO sales were literally ten times what they are now. Summary: Our market was on fire for 18 months after values bottomed out in early 2012, but over the past year the market has really slowed, and is ultimately trying to figure out how to be normal again. The beginning of 2014 has shown a typical seasonal uptick, but overall the market feels as if it is cooling more than not since some properties are being priced at similar levels to the most recent sales (or slightly lower in some areas). The market is competitive because inventory is still low, but at the same time it is very price sensitive. Buyers are not biting on listings that are priced too high, and they are not willing to pay top dollar for outdated homes either. In a hot market buyers tend to look past some negatives when inventory is really tight, but that’s becoming less common now. By the way, I’ll share some Placer County and regional trends in a few days. As always a great post Ryan. It is a far cry from what you were reporting on last year. Your area seems to be going through some of what Birmingham is experiencing. Properties in the popular price ranges, that are in great shape are moving, however if it is in a price range where there are not a lot of buyers or the house is not in tip top shape sales are struggling. I look forward to seeing what direction your market heads in. Thanks, Tom. It would be easy if real estate always stayed the same. That way we would always know what to expect. But the market is a living organism, so it takes skill to interpret what it is doing (and why it is moving). It’s also been interesting watching your market too. Keep up the great posts on your end. Thanks again for the kudos.